A winery focusing on high quality Pinot Noir, I recently had the chance to visit the winery’s tasting room in Dundee. The winery is owned by South African winery owners, Antony & Angela Beck and they have utilized eminent winemaker, Ken Wright to craft their Pinot Noirs. Angela Estate sources from two Yamhill-Carlton vineyard sites. The Angela Estate vineyard was first planted in 2006 (21 acres) to Dijon clones 777, 115 and Wadenswil as well. An additional 13 acres were planted in 2007. Because of the uniqueness of the Savannah Ridge, the entire vineyard is usually harvested in one day. Angela Estate also sources from the Abbot Claim Vineyard (16 acres) located in the Savannah Ridge, is a small east-west ridgeline of sedimentary rock just east of Carlton. Soils are mostly Wellsdale with some areas of Willakenzie, Melbourne and Peavine. Vines are roughly an equal mix of Pommard clone on Riparia Gloire rootstock, as well as Dijon clones 777 and 115 as this vineyard vineyard is managed by Mark Gould of Ken Wright Cellars. I was impressed with their recent lineup of Pinot Noirs. 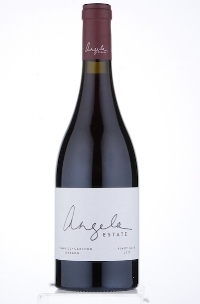 Look for their 2013 Angela Estate ‘Abbot’s Claim’ Pinot Noir (WWB, 92) which shows a wonderful range of flavors and aromatics, as well as lovely terroir. Learn more about Angela Estate at http://angelaestate.com/ Here are the great new release wines from Angela Estate.